This is so truthful. If you have every gone through a stressful time in your life, I am sure you know how truthful this statement is. For all of the worrying that we do whether it’s worrying about our families, our jobs, having enough money or health issues, these worries do nothing but drain you of your energy in the moment. 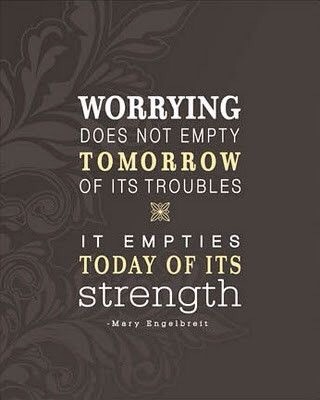 We as human beings have to realize that worrying so much today does not solve the problem in the future. Only by doing and working to solve the issue will our worrying alleviate.